MANSFIELD, Mass. 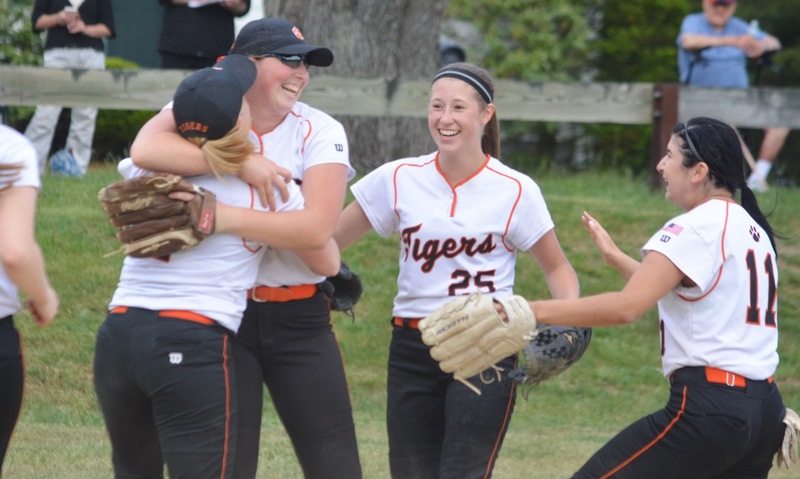 -For the first time in five seasons of competing in the Hockomock, Taunton softball can proclaim itself the best following a 12-0 victory at Mansfield on Monday afternoon that clinched a one-loss league campaign and at least a one-game advantage over King Philip. It is not the first Hockomock title in the program’s history (the Tigers and Warriors shared the title in 2014), but it is the first time that Taunton will finish the season alone in first place in the Kelley-Rex division, ending a streak of nine straight titles by KP. “It means a lot to us,” said Taunton coach Dave Lewry. “It was nice getting a share a couple years ago but we’ve been on top all year and to drop back and potentially lose it or end up in another tie was not what we were looking for, so this one feels good. Taunton had the opportunity to clinch the title on Sunday but lost for the at Milford (its first loss of the season), which added even more motivation to not allow the outright title slip away as it has in the past couple of years. Wade said, “We came in this year and we just wanted it. The loss yesterday just made us want it even more. We did not want to lose today. The Tigers did not waste any time putting themselves in a position to clinch the title, scoring four runs in the top of the first. Freshman Jaime Brown was moved up to the top of the order, replacing Liana Duarte, and that switch paid immediate dividends. Brown lined a lead-off triple to right and would score on a wild pitch. After Aimee Kistner singled and Meghan Navarro reached on an error, sophomore Kya Enos blasted a three-run homer to left center, using her speed to score standing up. Mansfield had runners on base in the second and third innings against Kistner, who was pitching her second game in as many days, but both times the Taunton pitcher got the out that she needed to escape unscathed. Those missed opportunities would be the last ones that the Hornets would get. Kistner seemed to get stronger as the game wore on, mixing her pitches and increasing her velocity in the later innings. She retired the final 13 hitters that she faced. Mansfield would finish with just one hit, a third inning single by Megan Letendre. Kara Bendanillo walked, Maddie Letendre reached on an error, and Liz Mackin reached on a fielder’s choice. That was it for the home team. Meanwhile, the Taunton lineup showed that it has pop from all positions. Duarte led off the fifth with a bunt single followed by an infield single from Brown. Wade drove her in with a single to left and then Kistner (3-for-4) cleared the bases with a triple to center. Madi Letendre retired back-to-back hitters, but Sarah Bagge brought in courtesy runner Hailey Medeiros to make it 8-0. Katie Van Zandt singled to start the sixth and would come home on a throwing error, while Wade reached on an infield single, stole second, moved up on the error and would score her second run of the game on Kistner’s third run drive in. In the top of the seventh, Duarte (2-for-4) lined a triple to right field, scoring Bagge and Van Zandt and making Lewry look like a genius for moving her down to the nine-hole on Monday. The season has been one big pay-off for the Tigers, who clinched the Kelley-Rex title with their 14th shutout of the spring. Taunton has outscored opponents 220-16 and finished a perfect 10-0 against teams from the division. Taunton (19-1, 15-1) will close out the regular season against Dighton-Rehoboth and city rival Coyle & Cassidy. Mansfield (11-7, 8-7) finishes up with Holliston and Canton. MILFORD, Mass. – In the middle of the season, Milford went through a rough patch, what head coach Steve DiVitto labeled a “lull.” The Hawks followed up a big win against defending state champion St. Peter Marian with a loss to North Attleboro. 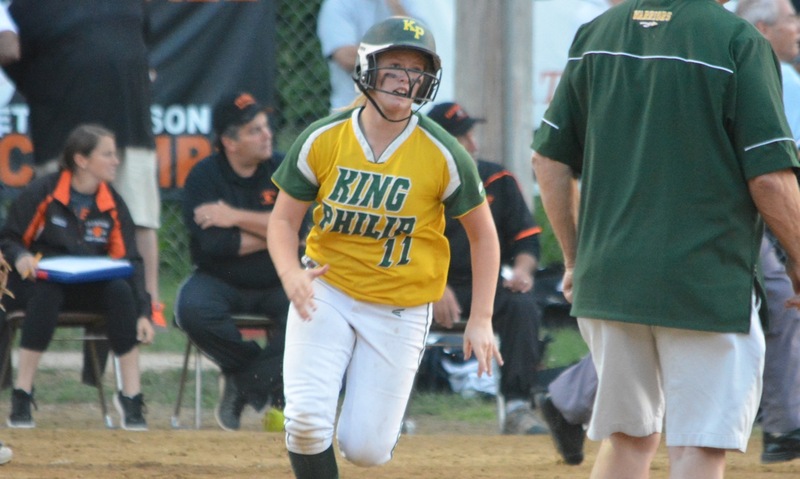 They beat Sharon but then were beaten 12-0 by King Philip. A win against Foxboro was was followed by a loss to Franklin. At the beginning of last week, DiVitto spoke to his team and told them it was time to get past the “Dog Days” of the schedule and start ramping up to be ready to go in the tournament. In front of a huge crowd and with an intensity that felt more like June than the middle of May the Hawks responded on Sunday afternoon with a 7-3 victory over previously undefeated Taunton in a battle of Hockomock League champions. “We wanted to play a complete game and we knew it would take a complete game to beat them,” said DiVitto. 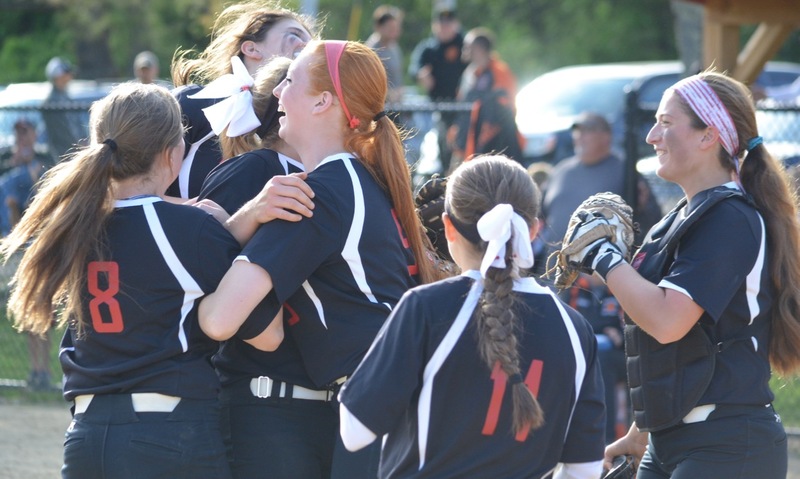 “We wanted to come out and play our brand of softball and compete…and we were fortunate enough to come out on top. Taunton took the lead in its first at-bat. Jordan Wade reached on a fielder’s choice with one out and moved up to second on a groundout. Fellow five-year starter Meghan Navarro provided the big hit with a single to center that brought home the opening run. While Milford entered the game having scored 171 runs, the Tigers had only allowed nine all season. So, an early one-run deficit felt like a lot more to the Hawks. In the bottom of the second, they received a jolt of life from one of their seniors. Kaitlyn DeCapua opened the inning with a single to left off Aimee Kistner. Megan Jacques was up next and the catcher blasted a two-run homer over the left field fence (her first home run of the season) to put Milford in front. Kelley Reichert started the game for the Hawks, who were playing their fourth game in six days, but after Wade led-off the third with a single, DiVitto made the change and brought in Ali Atherton. She would allow only three hits in five innings of relief. One of those hits tied the game in the third, as Kya Enos lined a double that Maggie Farrell laid out for but missed by inches in left center. Wade came around to score her second run of the game. It stayed tied 2-2 heading into the bottom of the fifth and the game was being played at a tempo and at a competitive level befitting two teams that have the potential to add to their Kelley-Rex and Davenport division titles. Enos made a sliding grab of a sinking liner to end the third, after Kistner, Wade and Katie Van Zandt turned a 1-6-3 double play. Navarro was also excellent in the field, creating all three outs in a perfect fourth inning and making a nice pick of a liner to start the sixth. Jill Powers and Emily Piergustavo made similar plays in the field for the Hawks. The wheels fell off for Taunton in the fifth. With one out, Wade made a rare throwing error to allow Shannon Cormier to reach. Kate Irwin was next and she bunted past the charging Jaime Brown at third for an infield single. Cormier would come in to score on a second Taunton error and an inning that should have already been over continued for the Hawks offense. Milford made the Tigers pay. Jess Tomaso singled to center and that scored Irwin and two batters later DeCapua cleared the bases with a single that plated a pair of runs and pushed the Milford lead to 6-2. “We’ve played a lot of great teams and it’s just that; its the team that can capitalize on the mistakes that’s going to win,” said DiVitto. Taunton coach Dave Lewry remarked, “We haven’t had an inning like that all year, especially where the snowball goes down the hill and it just gets bigger and bigger and it did that. With two outs in the sixth, Cormier again provided Milford with punch at the bottom of the order with a triple that landed just inside the line in left. She scored on Irwin’s second infield single in as many innings. Navarro picked up her second RBI of the game with a single to score Liana Duarte in the seventh, but that was as close as Taunton would get, as Atherton finished the game with her third strikeout. Jacques said, “This is a really great win. Everyone did their job and they did it well and I think that was the ultimate deciding factor between who won and lost. Taunton (18-1, 14-1) can clinch its first outright Hockomock title with a win at Mansfield on Monday. Milford (15-4,12-3) will wrap up the regular season against Stoughton on Tuesday.